Whether you’re professional or amateur, here’s something all photographers are bound to love…the new Grip Tight GorillaPod Stand from Joby. This new must have accessory, is compatible with any smartphone, allowing you to position your phone almost anywhere. 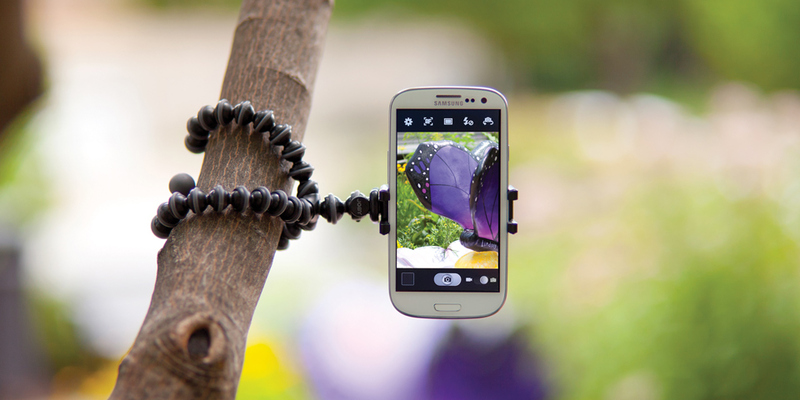 The GripTight GorillaPod is also perfect for using with your favorite phone case and doesn’t get in the way of your phone lens or filters – hassle-free, we love that! Your phone becomes an unstoppable force of photo and video production, adapting to the most uneven terrain so the entire world can become your personal studio. Its adjustable grip fits all smartphones with or without a case between 2.1-2.8 in | 54-72 mm wide, and reliable rubber grip pads secure your phone in place, while its flexible legs let you position your phone wherever you want it. We also have the GripTight Mount which works with any tripod and any phone, plus you can keep your phone in its snazzy case and pair it with your favorite phone accessories. Mount easily expands to grip your device and its internal steel springs allow mount to expand to the size of your device and grip it securely. So, from enthusiastic budding photographers to the Ansel Adams’ of the world…we’ve got what you need! Going on your holiers soon? Here’s what to pack!